This image shows a really ugly profile that has six layers. Letters and numbers are solid colours. The extra keys surrounding the letters are a solid colour, based on the Windows Accent Colour. The NumPad is a spiral, and the F-keys and Navigation keys are a spiral. All six of these effects run together with about 0.2% to 0.4% CPU usage on my machine, and hovers around 1.2% to 1.5% usage when the preview is running. These different effects show how you can easily select different zones and effects all in one profile. 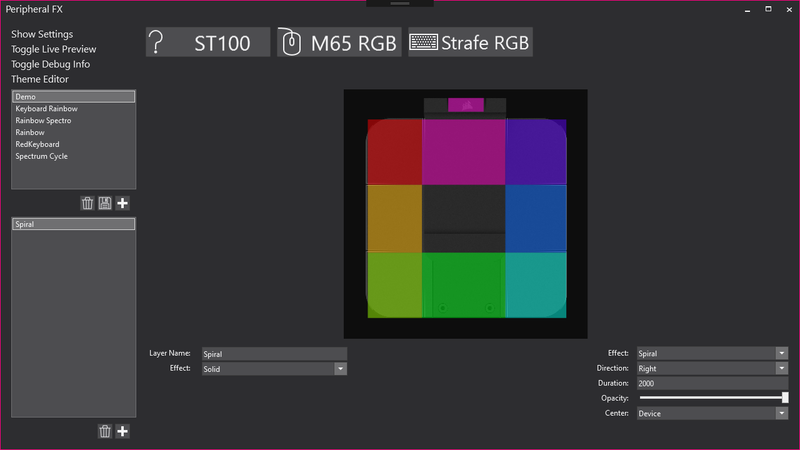 The Windows Accent Colour system has been greatly improved. It no longer checks the registry every few seconds, but instead hooks into Windows messaging systems and updates immediately when Windows updates it. Spiral and eventually Rainbow effects will be able to center themselves in the middle of the physical device, or they can calculate a center point based on the keys selected. This option is what allows the NumPad to have a small spiral, centered right in the middle of itself, as opposed to the function and navigation keys, which are far larger and centered in the middle of the device. 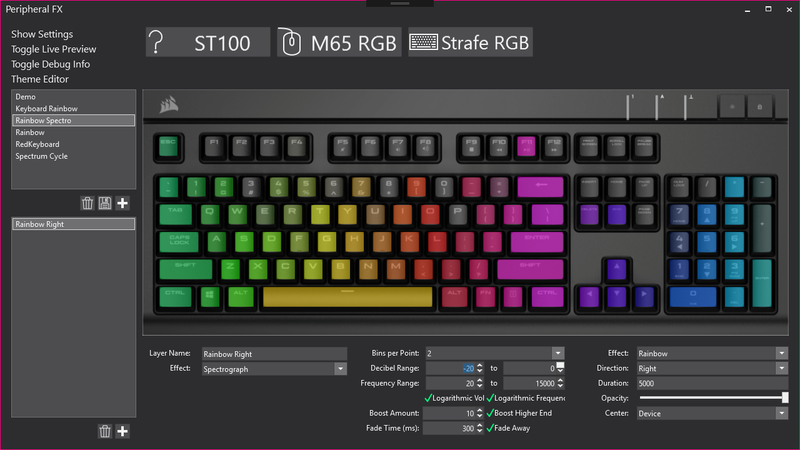 This image shows the ST100, in live-preview. There's still a question mark for the device icon, since I haven't drawn one yet. I'll get around to it eventually! You can also see some of the editing tools. I've created tools that make it significantly easier for me to create all the required maps for any new devices Corsair might create, so hopefully it'll be easier for me to keep everything up to date. Of course, the primary feature is being worked on! I'm re-writing the previous spectro algorithms, since they don't really work with this new framework I've created. It doesn't look quite as good yet, but it'll get there. I'll also be adding a beat analysis algorithm that can allow smaller devices like the mouse to pulse on the beat. Much to my surprise, the number one most-requested feature (after "how the hell does this even work?") was themes. I've created an integrated theme editor, with the ability to save and load themes. 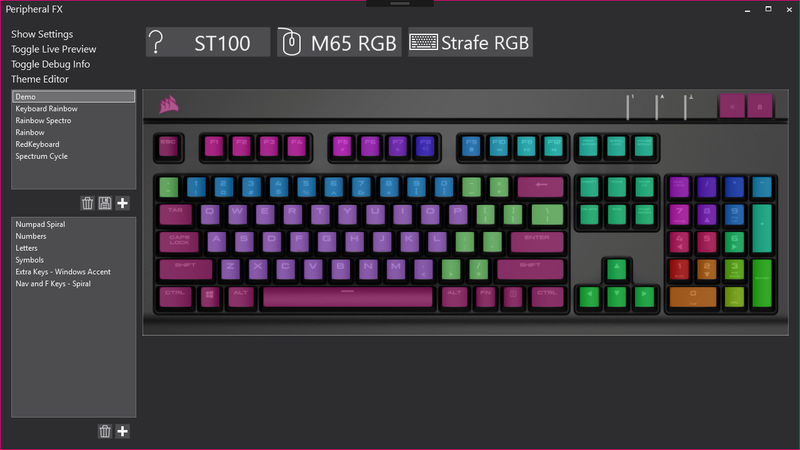 You can customize every colour that's used in the program. Have fun!